When I want to update the text of a row using Tree.SetItemText the program updates the text but it doesn't seem to commit the change. Because when I select another row the text changes back to what it was. When I select the row I've changed it shows the changed text. I've attached a screenshot of the issue. I'm also using .SetItemImage which isn't giving me this issue. Does anyone have a workaround the issue except for reloading the tree? Sounds like you may have found a bug. An alternate option, although not ideal, would be to delete and then insert back in that node. I was hoping I was doing something wrong and that it isn't a bug. I tried the insert, add and delete route but couldn't quite get that to work correctly. Make certain that your FULL $ROWDATA input string you concatenated is long enough read in Before Write logic. Do you delimit your Coding Structure or your Reporting Structure levels in your $ROWDATA? 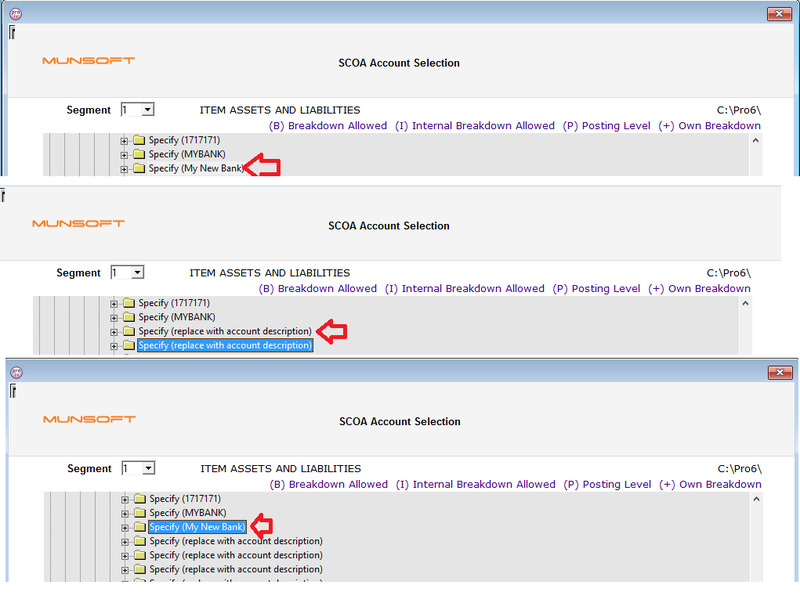 Your SCOA concatenated KEY to be 38 characters long within your $ROWDATA input string else you might encounter problem in committing the next record if you are working with your first few levels of scoa coding/reporting structures of your segment. In ADD MODE, initial your ActiveX parameters to Tree.FindByData and Tree.InsertRowSort methods. You've stated that you have called Tree.SelectItem method when adding. Enforce your commit by doing EODEXIT(1). If you using the CRUDing more than once in your function,you will encounter problems in committing,make a child file for the CRUDing table.